the bench, said four days ago that Mahatma Gandhi became a British agent by injecting religion into freedom struggle and that Subhash Chandra Bose was a Japanese agent. Members of Parliament wanted FIR filed against Katju. Bose was conveniently relegated to the status of ‘also included’. “On what law will you file FIR against me? None; but I suggest Lunacy Act”, retorted Justice Katju . He is a topper in law from Allahabad University and a descendant of eminent lawyers, politicians and a High Court judge, has presided over courts as a judge, chief justice of high court and noted judge of the Supreme Court with a few landmark judgments to his credit, and author of law books including one on ‘Mimansa Rules of Interpretation’, which I suppose deals with ancient Hindu law. The government should have taken his advice. There is no law against frustration and male menopause, nor one against freedom of expression but there has to be one for lunacy – since Justice Katju himself says so and admits to his lunatic culpability by Freudian logic. In the event, no FIR was filed; only the Rajya Sabha – the Upper House, ‘condemned’ Katju’s statement. “This House expresses its unequivocal condemnation of the recent remarks of the former judge of the Supreme Court, Shri Justice Markandey Katju, against the Father of the Nation Mahatma Gandhi and Netaji Subhash Chandra Bose who led the Indian National Army for the freedom of the country,” said the resolution, read out by chairman Hamid Ansari. Damp squib after many fireworks. What law will you apply against Finance Minister Arun Jaitley, also a lawyer who compared Yoga gymnast Ramdev to Mahatma Gandhi? Now Mr. Ramdev is one man from the State who once ran at the sight of policemen , hiding behind the saris of supporters and covering himself in one. A ‘Trust’ in his name owns an island off the coast of Scotland; those who opposed him got their effigies burnt; he never dared sue Brinda Karat for alleging that some of the medicines produced in his factory contained human or animal bones. In this Country where pre-natal gender determination is illegal, his ‘Patanjali Medical Stores’ stock a medicine called “Putrajeeva Rakshak Seed‘ and openly market the ‘seed’ that assures you of safe life for sons – not daughters. What the name of this seed implies should be obvious. I do remember him making unsustainable statistics about money in the Swiss bank talking expansively about rampant corruption as every Indian is prone to do. I do not recall Ramdev running a sustained campaign against corruption and black money the way Gandhiji did against untouchability, British Raj, and many other irregularities rampant at his time. In April 2016, Ramdev boldly announced that if it wasn’t for the law coming in the way, he would have sliced the throats of lakhs (hundred-thousands) of throats that failed to chant Bharat-Mata ki Jai (victory to Mother India). Ever since, people like me have been contemplating if they should wear steel belts around their throats. Surely, Gandhiji lacked all of Ramdev’s qualifications. For instance, Gandhiji certainly lacked the skill to fantasize cutting human throats. He didn’t run away from police – he faced them and went to jail (a qualification – a short stint in the name of ‘preventive detention’ – Jaitley shares thanks to Indira Gandhi). He actually ran campaigns, led non-violent struggles against social injustices and colonialism. Unlike Ramdev, Gandhiji did not put a stop to his ‘fast unto death satyagraha’ as soon as hunger struck. Whether Gandhiji owned any land, let alone an island, nobody knows – his ‘Ashrams’ were not owned by him. So how does Ramdev compare with Mahatma Gandhi in Jetley’s mind ? 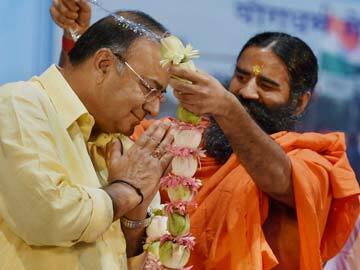 The reason given is that Ramdev encouraged ‘voters’ to vote for Jaitley’s party. Gandhiji is not known to have urged voters to vote for any party. What is well known is that he wanted the Congress Party to dismantle as soon as the purpose of its very creation was achieved – independence from Britain. Unlike Katju, Jaitley is not yet of the male menopause age, nor should have any cause for frustration – he has not been thrown out of his important job of the Finance Minister of India the way Katju had to resign as the chairman of the Press Council. So what Act would you like to use against him for insulting the Father of the Nation and for comparing him with the seventh- class drop out and a pretender to holiness with an assumed name ‘dev’ that means god? Of Katju, Jaitley said in the Rajya Sabha : “It is unquestionable that Gandhi probably has been the greatest citizen of India in the recent era.” Why just probably?. Could Jaitley think of someone else who will ‘probably’ fill the bill – is it ‘Veer’ Savarkar or Prime Minister Mr. Modi? Has Jaitley heard of any other Indian in this era of whom Einstein could have described thus : “Generations to come would scarce believe that a man such as this ever worked on the earth“? The honorific ‘Veer’ to the man named Vinayak Damodar Savarkar was meant to denote bravery. In fact, Savarkar is one of the few cowards among the well known men of pre-independence days who wrote serial letters of apology to the British Government to get release from incarceration. He promised never to fight for freedom again, and dutifully stuck to that promise, and made the organisation he promoted – RSS – to follow suit. RSS was one national organization of India that never fought for freedom till freedom actually dawned. Of Justice Katju, Jaitley said in addition: “This also is reflective of the present system by which individuals with this kind of mindset get appointed as judges of the apex court…. This, speaks of the “weakness of the present system which we are trying to change“. By implication, Jaitley is going to bring about a blasphemy law that would curtail freedom of speech and prevent the appointment of anyone to the judiciary who speaks out his mind – be it after he retires. Now that Katju is out of the nets of such a proposed law, what provision would he propose to introduce – expunge the name of Justice Katju from the list of former judges of the Supreme Court, annul his pension, or have him jailed under a new blasphemy law with retrospective effect? 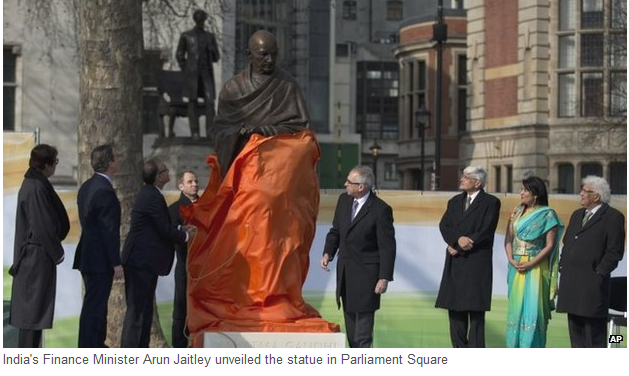 In the meanwhile, while a budget session is on with 60-odd bills pending, Finance Minister Jaitley rushed to unveil a magnificent statue (the best so far, I would say) by British sculptor, Philip Jackson in Britain’s Parliament Square. Some kind of atonement for Katju’s utterance or for his own party’s earlier stand on Gandhi? Jaitley came to politics through Jansangh, the earlier incarnation of his current ruling party BJP, and a direct derivative of Hindu Mahasabha whose ideologue was British -rule apologist Vinayak Damodar Savarkar. Jaitley and his party men praise Sardar Vallabhai Patel, the first Home Minister of India while running down Prime Minister Nehru and his later generations (‘dynasty’). “I have kept myself almost in daily touch with the progress of the investigation regarding Bapu’s assassination case….It was a fanatical wing of the Hindu Mahasabha directly under Savarkar that “[hatched] the conspiracy and saw it through” ( Sardar Patel’s Correspondence, Volume 6, page 56). At the instance of LK Adwani, the sidelined and sulking stalwart of Jaitley’s party, the international airport at Port Blair has been named after Vinayak Damodar Savarkar who wrote at least two letters of apology in 1911 and 1913 to the British Government praising it to high heavens, and promising never to act against Brtish rule, but to concentrate his attention on those “who came through the mountains ” meaning Muslims. He did abide by his promise when he was finally released, and despite being a self-proclaimed atheist, took up cudgels against Muslims. Like Jinnah, he proposed the two nation theory – proposition for creating Pakistan, which Gandhi said, rather futilely, would happen ‘over my dead body’. During Savarkar’s trials for complicity in the murder of Mahatma Gandhi, apologist Digambar Badge (pronounced Bud-gay) whom trial judge described as ‘Truthful witness” gave clear evidence against Savarkar. The Hindu reported : Badge stated in court that evidence that Godse and accomplice Narayan Apte visited Savarkar at his house on January 14 and 17, 1948. On each occasion, Badge was asked to stay outside. On the second occasion he heard Savarkar’s encouraging words to Godse and Apte: “Yashasvi houn ya” (succeed and come). The two corroborating witnesses said no more than that the three had got down before the house, but it had two other residents besides. Since the law requires independent corroboration of an approver’s testimony, Savarkar was acquitted. There were other witnesses, whose evidence was not produced before the Court. A commission appointed by Gulzarilal Nanda, Home minister of India in 1966 to finally put the doubts about Mahatma Gandhi’s murder, came out with evidence from two key witnesses: Appa Ramachandra Kasar, Savarkar’s bodyguard, and Gajanan Vishnu Damle, his secretary. Kasar told the Kapur Commission that Godse and Apte visited Savarkar on or about 23 or 24 January, which was when they returned from Delhi after the bomb incident. Damle deposed that Godse and Apte saw Savarkar in the middle of January and sat with him (Savarkar) in his garden. Despite the fact that Godse had taken up the entire responsibility of the murder himself, if this corroboration by Sarkar’s bodyguard and secretary had been introduced in the original trials, Savarkar would have been hanging along with Godse. 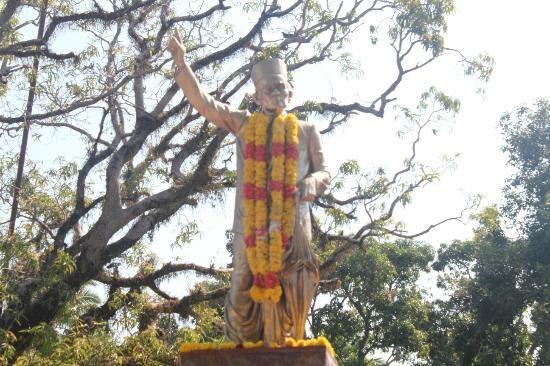 It is this man who has an International airport of India named after him and a statue of his installed outside the cellular jail in Andaman (not one of the many genuine heroes who were hung without giving in to the British) . 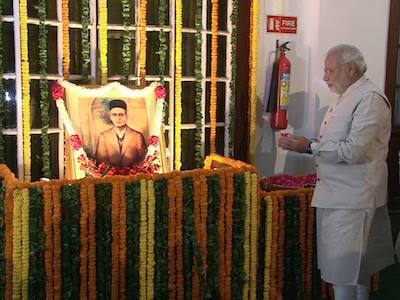 Prime Minister Modi worships Savarkar’s statue. Before leaving for Parliament on 28th May, Mr. Modi made it a point to seek the blessings of Late Savarkar – a self-confessed atheist who laughed at idol worship. There is nothing ironic about the people who worship and praise a man who was complicit in the murder of the Father of the Nation condemning and looking for a clause to punish a maverick ex-judge who made allegations against him. Politicians in India switch their ideologies and party allegiance to suit the occasion. Anybody who has not forgotten the recent history Gujarat in particular would remember that Prime Minister Modi was persona-non-grata to several civilized nations till the outcome of elections became reasonably certain. Political volte face is common to all countries; however, Obama did not forget to state, after praising Modi’s development agenda, that “India will succeed so long as it is not splintered on religious lines“. He had evidently been briefed by his intelligence agencies of the alleged (but legally refuted) neglect of the chief minister of Gujarat to stop the 2002 riots – just as Rajiv Gandhi indirectly encouraged the killing of Sikhs by his blatant silence – and the recent utterances of his party men for the reformation of India to a Hindu theological Nation under Mr. Modi’s reign. Thankfully, Mr. Modi himself has made public statements against such retrograde and reactionary ambitions. It is probable that it was India’s communal fault lines that Obama referred to infuriated Katju to the extent of saying that Mahatma Gandhi, by injecting his religious fervor into politics, acted as a British agent in the latter’s policy of divide and rule. The Kashmiri Pundit, who could write a whole book on Hindu’s Mimansa interpretation of laws and lecture a scientific conference on Sanskrit as a language of science and visits all Hindu temples (without fanfare) in Ayodhya except the alleged Ram Janmabhoomi is naturally disturbed when a Minister in Goa says Modi will help build India into a Hindu Rashtra and Togadia of RSS announces that his organization will be patient till 2019 for Modi to deal with other problems and then start building Ram Mandir on disputed land. Such possibilities do ruffle even saner minds. Justice Katju is prone to shoot off his mouth often enough and to get miffed when journalists ask him uncomfortable questions. Yet his anger, however miss-directed, has some justification. It does not lie in the mouth of RSS progenies to find fault with someone who criticizes, however unjustly, the father of the Nation. Just as neither Abraham Lincoln nor George Washington is beyond questioning in the United States, Freedom of Expression (and thereby criticism) is guaranteed to anyone – why only a former Justice of the Supreme Court – by the Constitution of India. I do not agree with Justice Katju, I do not disagree with the Upper House even condemning him , but calling for ‘action against him (which is another exercise in warning against freedom of expression). Contemplating regressive laws against individual views is sacrilegious of our Constitution. If you think I am wrong on that point, ask our Prime Minister, who mistook the name of the Father of the Nation to that of a Malayalam Superstar – Mohanlal. ‹ PreviousWhy should I or should I not respect Mr. Narendra Modi? Next ›What do you call a person who thinks all Muslims are terrorists just because of ISIS?